One of the website that I found says this: "When patients have PTH levels above 200 it is because their tumor is very old (usually this means over 10-12 years old) and the tumor is composed of MANY cells. 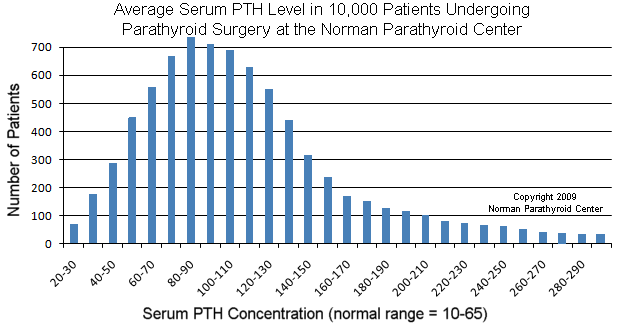 If your PTH level is over 200, then some doctor somewhere was asleep at the wheel. This should not be allowed to happen, and the amount of destruction to your body is generally worse." * Wow do I know this! Loss of energy. Don't feel like doing much. Tired all the time. Chronic fatigue. Just don't feel well; don't quite feel normal. Hard to explain but just feel kind of bad. Feel old. Don't have the interest in things that you used to. Can't concentrate, or can't keep your concentration like in the past. Bones hurt; typically it's bones in the legs and arms but can be most bones. Don't sleep like you used to. Wake up in middle of night. Trouble getting to sleep. Heart Palpitations (arrhythmias). Typically atrial arrhythmias. Most people with hyperparathyroidism will have 4 - 6 of these symptoms. Some will have lots of them. A few people will say they don't have any... but after an operation they will often say otherwise. 95% of people with hyperparathyroidism will have 3 or more of these symptoms. 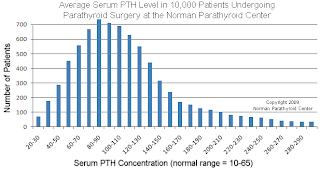 In general, the longer you have hyperparathyroidism, the more symptoms you will develop. Click here for a cartoon of the symptoms. While this is a funny cartoon remember hyperparathyroidism is not a joke is it serious and causes life changes. * Hyperparathyroidism: Disease of the Parathyroid Glands. I am in shock. I just got my records from my last visit to the "specialist" and the results of some of my blood work, and I will now always get copies. I just found out that this problem that I have may go back as far as 10-12 years. That surgery can fix the many problems cause by the problem some in just hours after the surgery and others within 4-6 months. But the biggest thing is that my headaches, bone aches, fatigue, brain fog, high blood pressure, and just the general feeling not quite right could soon be a thing of the past. So I urge you all - take charge of your health. get copies of tests and doctors notes. and be the squeaky wheel. Good luck. I am now starting to look forward in a different way to Chalica this year. I am hoping that I will have had my surgery and will be starting a "new life". I will be doing some more writing, as we get closer to Chalica.